The focus of full evening dress is the evening tailcoat. 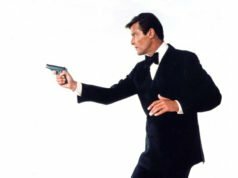 Bond has in fact worn a different type of tailcoat: a morning coat. Like the morning coat, the evening tailcoat has a waist seam and tails in the back. The evening tailcoat is either black or midnight blue, with black satin silk peaked lapels. Moore’s tailcoat, made by Cyril Castle, is cut with natural shoulders and roped sleeve heads, just as Moore’s lounge coats are. The front is double-breasted with three buttons down each side, but the front panels do not meet or fasten. Though not all tailcoats have breast pockets, Moore’s evening tailcoat has a welt breast pocket, adorned with a white linen handkerchief. There are four buttons on each sleeve, and all of the buttons on the tailcoat are in covered satin silk. The trousers have a long rise, double forward pleats and a silk braid down the side of each leg. Because the trousers sit so high it’s necessary that they are held up with braces. Though we don’t see Moore with the tailcoat off, he is most likely wearing braces. The single-breasted waistcoat is made of white cotton marcella. It is low cut with three mother of pearl buttons and square-cut lapels, and it is most likely backless. The shirt’s front has a stiff marcella bib to match the waistcoat. The front of the shirt closes with two mother of pearl studs. The shirt has a stiff, detachable wing collar and single link cuffs (stiff, single-layer cuffs to wear with cuff links). The bow tie is also white cotton marcella to match the shirt and waistcoat. Sometimes Moore wears the bow tie in front of the wing-collar tabs and sometimes behind. Both have shown to be historically correct, though fashion mavens of today such as Alan Flusser insist that the bow tie must be worn in front of the wing-collar tabs. 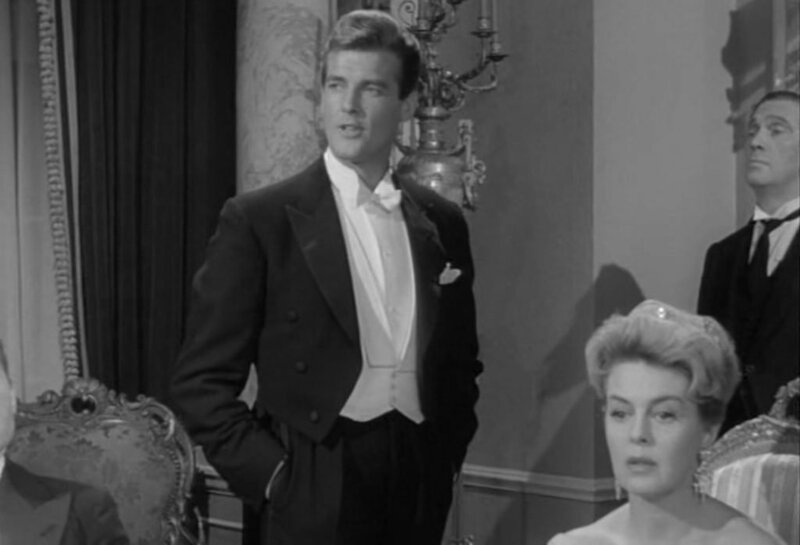 Moore wears the most traditional accessories with his evening wear: a black plush silk top hat and white kidskin gloves. However, he goes a step too far and carries a walking stick. This is a perfect example of full dress. 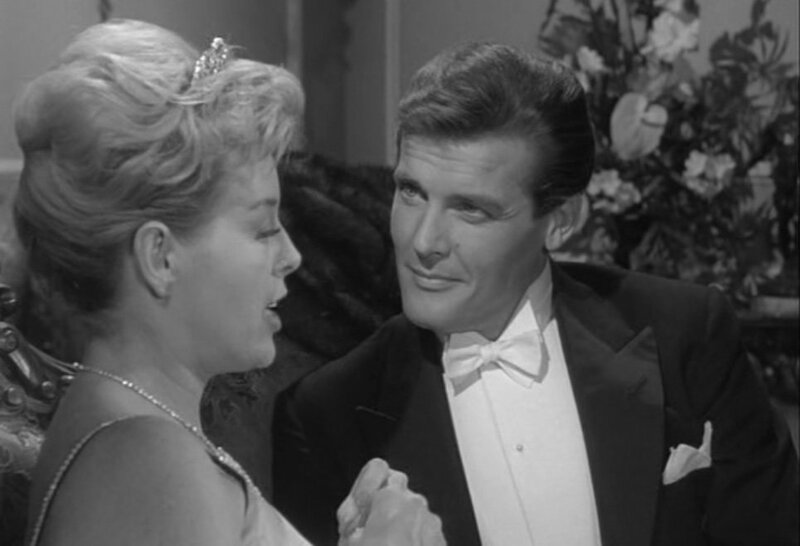 More recently Roger Moore wears full evening dress in the 2011 television feature A Princess for Christmas, but it’s a most atrocious example of the style in every manner. It looks rather like a rental and fits very poorly. Full dress is very difficult to fit well when not bespoke, especially since the waistline of the tailcoat, the bottom of the waistcoat and the waist of the trousers all need to fit perfectly. The tailcoat’s waistline should mirror the waistline of the person wearing the tailcoat, though it can be adjusted to make one look taller or shorter. The waistcoat needs to be shorter so it does not show below the jacket’s waistline. And the trousers need to sit extra high on the waist so they are completely covered by the waistcoat. Cyril Castle fits all three parts perfectly for Moore. See Black Tie Guide for more on full evening dress. Matt, the silk top hat and white kidskin gloves you find appropriate however, the cane you feel is inappropriate. Why so? Also, I have a personal aversion to wing collar shirts with evening dress although I accept that they do fit with this type of outfit. It’s when they’re paired with standard black tie evening dress that I find them particularly distasteful. However, I can’t seem to recall Bond having worn a wing collar shirt with evening dress even at his most sartorially bankrupt! Bond never would wear a wing collar with black tie, but with full dress it’s necessary. A spread collar worn with full dress could make one look like the waitstaff. At such formal occasions, the waitstaff would wear either court dress or incorrect versions of full evening dress (like a black bow tie or black waistcoat). What do you mean by court dress, Matt ? A dress code required at courts in the UK. Servants at white tie occasions were often dressed in some form of court dress to distinguish servants from the guests. For less formal occasions, servants were typically dressed one level above the guests. Kyle, to follow on from your interesting aside, there is a photo of 3 of the ex-Bonds; Messrs. Lazenby, Moore and Dalton in evening dress together in the book “Bond on Bond”. Lazenby has this awful wing collar shirt, Dalton has a crooked bow tie. Moore, of course, looked faultless. My personal bias does have a valid ground. A lovely outfit. 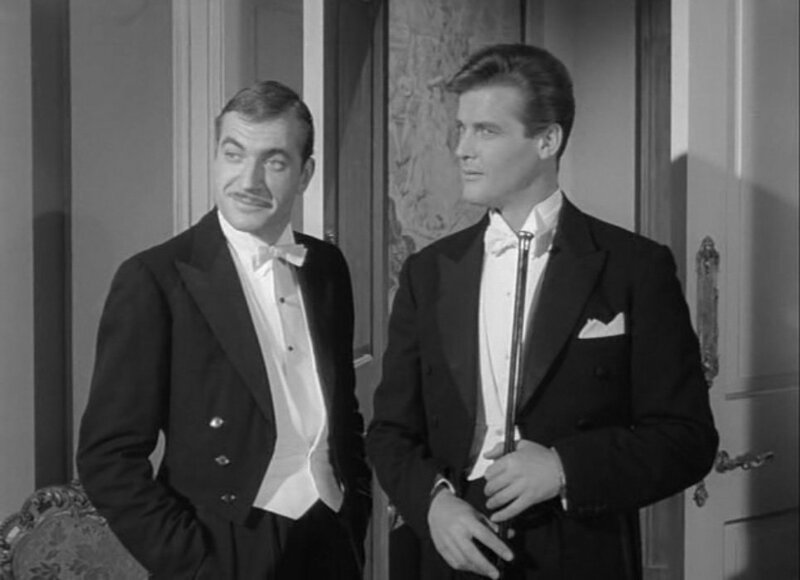 Whilst rarely seen, properly done white tie evening dress is both beautiful and exceptionally flattering for most men. The problem is that the tailcoat requires a lot more tailoring than most jackets and needs to be matched to the individual. The only time I’ve had to wear it, I was wearing a rented model that doubtless was not as good as it could have been. It was still great fun. If one was being critical, might it not be that the jacket extends slightly too far over the waistcoat? I thought that a well balanced outfit should have both the coat and the waistcoat finish at the same point on the waist. That said, it is much better than the expanse of white waistcoat often seen below the end of the jacket. As for the cane, it is a traditional accompaniment to fig full. It is, of course, somewhat foppish and costumey. Perhaps that is deliberate, though? Doesn’t Templar often present himself as a slightly daft young man to disguise his true nature? The coat’s front should be longer than the waistcoat. If they were the same length, just a little movement would expose the waistcoat underneath. I do find that the cane is too “costumey”, and by this time it was obsolete. Beautiful. I love white tie, and even found an occasion to wear it once. This is an excellent example. And I completely agree with David on wing collars though they do fit with white tie. I would leave the cane though. This is the evidence that drape chest work better with more large lapels. How i said in my comment of the “drape post”,drape chest,especially full drape chest with padded shoulders , is not good with narrow lapels. Compared to wide lapels, like the ones of the 30s-40s, these ones aren’t particulary large. They are just of medium width. However, I agree with you about the draped chest being more “effective” with lapels of medium/large width. It makes more sense. Carmelo/Le Chiffre: I am in full agreement. Please consider THE PRIZE, a 1963 spy thriller. Paul Newman and several other actors wear “Ivy League” versions of white tie and tails. Ie; slim cut legs, very narrow lapels and no attempt at drape. Not elegant at all. However, the suit here is exquisite. Thank goodness Moore got out of the habit of putting his hands in his pockets. BTW, a few years ago there were pictures in the press of Sir Roger attending a royal wedding in white tie, and I strongly doubt that this was a rental or borrowed suit – it just looked too good. Is this not the tailcoat that Moore shared with Monty Berman and Richard Burton? I recall an anecdote about them never appearing at the same posh parties because they only had one white tie outfit between them! Perhaps it could be, and if it is Bermans may have made it. I’m not sure how many years those men shared the outfit, since the story came almost 10 years after this episode was filmed. But it clearly looks like it was made for Moore. Well, Roger is usually listed at 6’1″, though he claimed 6’2″ in an interview and he looks just over 6’0″ to me, but Burton is usually listed at 5’10”, which means he was 5’9″ on a good day in the morning. This outfit suits Moore perfectly. He could also have worn a pocket chain watch, an accessory often worn with white tie. I prefer larger jacket lapels myself, like in the 30s, but that’s just me. Interesting remark about wearing a bowtie behind the collar points, Matt. It may be a faux pas, but I appreciate this other way of wearing it. It’s a kind of rakish alternative, and it brings attention to the wing collar. Besides, some people wore it that way in the 30s too. I just have a question about the trousers : isn’t it customary to wear trousers with a (thin) double silk braid down the leg – as opposed to black tie trousers, which carry only one (larger) silk braid – with white tie ? White Tie may have either a double braid or one larger braid, as worn here. Assuming this was made for Moore… While I’m sure Roger Moore has the means and certainly the appreciation for bespoke suits, I’m just curious if (in relative terms to inflation) it was as expensive to have a bespoke suit made in the 60’s or before as it is today. I only ask as given even in the 60’s full evening dress was something I would think most men would only wear a handful of times in their entire life, and having one bespoke tailored would seem like a huge expense for something so seldom necessary. 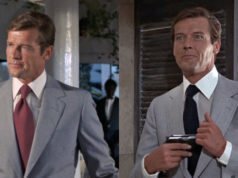 Given Roger Moore’s personal taste and hobby in tailoring it’s no surprise he would have one tailored for him, like I said I’m just wondering if there was more “economy of scale” reflected in the price of bespoke clothing when it was more common back then, or if it was still something as exclusive as it is now. Considering how many more tailors there used to be, bespoke clothing was not nearly as exclusive. I don’t know how much things cost then. I’ll take one, please. Credit it to Sir Roger Moore’s account. I also feel inclined to add, the waiter with the necktie to the right of Moore looks like… well, a waiter. Why men consciously choose to look like the waitstaff now by downgrading evening clothes with the improper tie (among other things) is beyond me. If it ever comes to that with Bond, I’ll know that real evening dress truly is dead.